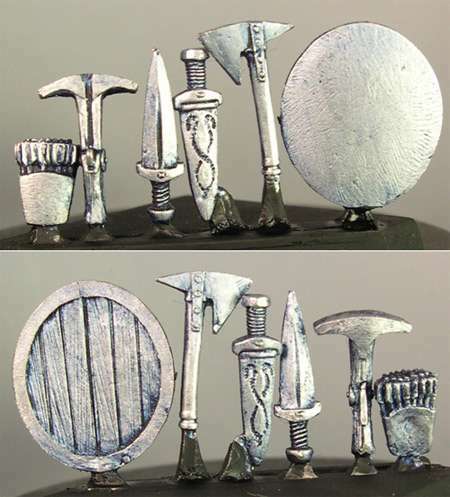 Sprue containing a quiver of arrows, a cross-bow, two short swords, an axe and a rounded shield. The shield is stretched leather on one side and wooden on the back with approx dimensions of 12mm x 19mm. The quiver is approx 7mm tall and the crossbow is approx 11mm long. The short-swords are 13mm long and one is in a scabbard. the axe is approx 12mm long and 7mm across the blades.